With the opening days of fishing season upon us in many states, it’s time to break out your fishing rods, fly reels, lures and tackle and hit your favorite fishing hole. 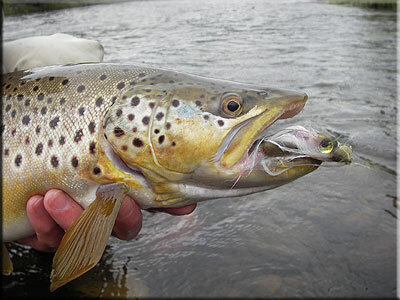 That could mean heading at the crack of dawn to one of the streams that the state stocks, a pond on your friend’s property, or that secret fishing hole where you hooked a whopper last spring. Hopefully your fishing rods are in good condition after being stored away for the past months because you stored your gear in a fishing rod rack in your garage or outdoor shed or somewhere else safe. If you’re not storing your fishing gear properly, it’s never too late to start! Keep those expensive rods protected, untangled and ready for action by keeping them stored in a fishing rod rack. 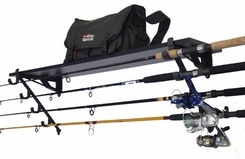 4 Rod Rack: this simple and affordable ($19.99) fishing rod rack holds up to 4 rods and 20 total pounds. You can mount it vertically on the wall of your garage, shed, basement, or wherever else – or – you can mount it horizontally (ceiling is an option) on the wall to really maximize your storage space. 4 Rod Rack and Shelf: if you want to step your storage options up a notch, check out this rack and shelf system. This rack provides storage for 4 fishing rods with the added bonus of a shelf placed above the top rod to create storage for your tackle box; the rods must be stored horizontally with this rack to utilize the storage that the shelf provides. Made of glass-filled nylon, strong and very light. Wood Rod Racks: for a little more durability, check out solid hardwood (birch dowels) fishing rod racks that come built to hold either 2 rods, 4 rods, or 8 rods, depending on the size of your rod quiver. This two piece design can also be mounted vertically or horizontally on your available wall space. No assembly required on these racks, which come pre-drilled at 16” on center for stud mount. Here’s to hoping you finally reel in the big one this year! I am really impressed by the work you did in this article. It’s great enough to pull my attention and in reading this article for once to understand that your pen is really mightier than the sword.